I haven’t always been the biggest fan of iCivics, the popular learning games site begun by former Supreme Court Justice Sandra Day O’Connor. I’ve thought that many (but not all) of their games have been overly-complicated, and they really put their foot in it with a horribly-done one on immigration (see Sandra Day O’Connor’s Site To Change Immigration Game Because Of Your Comments). But they seem to have really stepped-up their “game” recently. Now, teachers can easily create free virtual classrooms and monitor student progress on the site. The part I’m really excited about is a tool called DB Quest (you can go to the link, but it won’t let you access it until you register, which is free and easy). It’s an interactive to access and learn about primary source documents, and I like it a lot. 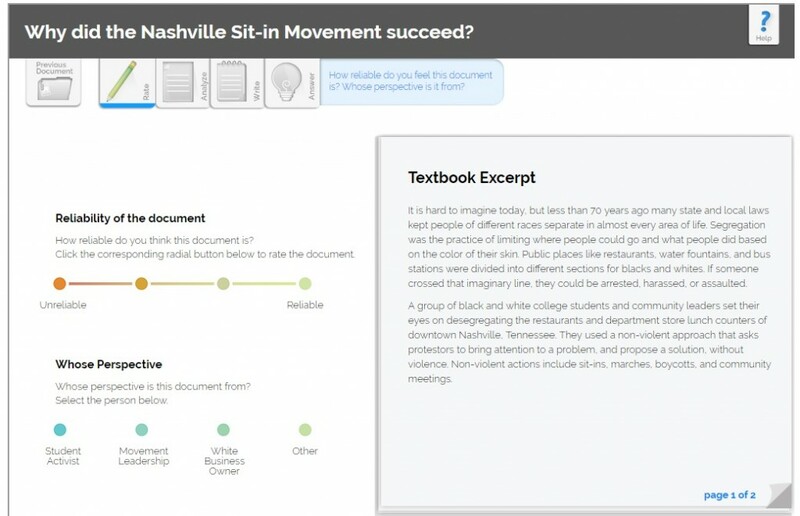 They only have one lesson there now – on the Nashville Civil Rights Sit-Ins – but have just received funding from the Library of Congress to expand it (I just received that info via a LOC email, but there’s no way to link to it). I hope they develop many more lessons using that DBQuest tool, and I suspect many teachers will agree with me. NextConfirmed! I’m Writing Two More Books….